♦ The film won the Palme d’Or at the Cannes Film Festival in 1984. This 1984 road movie was directed by Wim Wenders, starring Harry Dean Stanton, Dean Stockwell, Nastassja Kinski, and Hunter Carson. The distinctive musical score was composed by Ry Cooder. The plot focuses on the amnesiac Travis (Stanton) who, after mysteriously wandering out of the desert, attempts to reunite with his brother (Stockwell) and seven-year-old son (Carson). 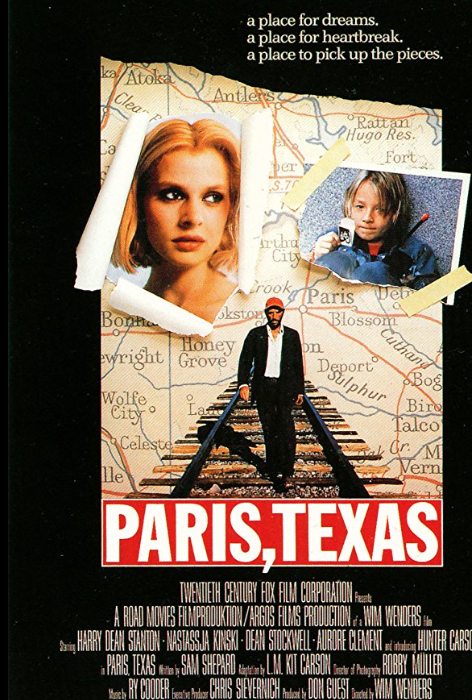 After reconnecting with his son, Travis and the boy end up embarking on a voyage through the American Southwest to track down Travis’ long-missing wife (Kinski). ♦️ Μετά από τέσσερα χρόνια ανεξήγητης απουσίας, ο Τράβις εμφανίζεται ξαφνικά στην έρημο. Σύντομα όμως θα ξαναρχίσει την περιπλάνηση προς αναζήτηση της παλιάς του ζωής και του εαυτού του. ♦️ Μια κλασική ταινία ύμνος στον ευρωπαϊκό κινηματογράφο.